You will always be judged by people you come in contact with based on how you look, what you say and how you say it. In many cultures a handshake is the first human physical contact that you will have with strangers, or people you know and are not familiar with. A good first impression can be a deal maker and the opposite can be a deal breaker. In alignment with improving the first impression you give people, I want to share with you five keys to a very good handshake. I was first exposed to this information when Cindy Carpenter shared it as components of the General Motors Handshake Formula. Eye contact: Eyes are the window to the soul. When you look at someone in the eyes during your handshake, it gives you the opportunity to create a deeper connection instantly. The stronger the initial connection, the more influence you can subsequently have on the individual. Verbal greeting: Acknowledge the person you are greeting with by mentioning his or her name. Someone’s name is the most precious sound they can hear. When you add a pleasant verbal greeting to your handshake, you make an even better impression. 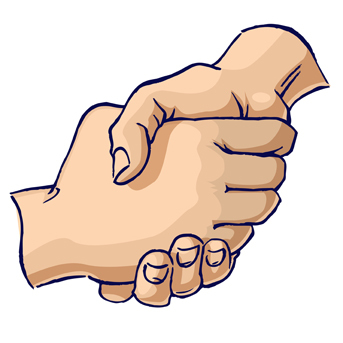 Completeness of grip: Go all in with your handshake, that’s how you communicate power, strength and confidence. If your hand is too big or too small compared to average, don’t be intimated. The people you shake hand with will feel your energy. Temperature: I have shaken hand with many people and I am sure just like myself you have experienced people whose hands were sweaty, too warm or too cold. The ideal temperature for a memorable handshake is the body temperature. Keep your hands at body temperatures in anticipations of handshakes. Remember it contributes to a great first impression. Strength: Again, you want to communicate confidence and power to the person you are shaking hand with. The secret with strength is to measure it in proportion to the size and the demeanor of the person you are are greeting. When in doubt, give a firm rather than flimsy handshake. Who have you had a most memorable handshake with? What made it memorable? Day 7 of 21: 100 words per day for 21 days. 393 words. Why are you on the payroll? Is there one absolute absolute in life?